In celebration of Secret Recipe's Sweet 16th Anniversary, come this 16th November 2013 three separate awesome promotion will kick off simultaneously. Working along with WeChat, you will get to enjoy the Buy 1 Free 1 Slice Of Cake with any dine-in, Candy Crushing RM16 Value Meal, and RM16 Off Any Cake (1 day only) promotion. Read up below to find out more. The other day, a group of bloggers and I were invited to savour some of the RM16 value meals offered by Secret Recipe to celebrate their Sweet 16 anniversary. Love the hype, love the meals even more. For RM16, we have a choice of 6 different sets ranging from burgers, cakes, western food, to tomyum and ice-creams. Named the Candy Crushing RM16 value deals, the promo is applicable for dine-in orders only from 16th to 30th November. Each of the bloggers present that afternoon got to try a set of their choice. I chose set D, the mega treat combo comprising of the grilled black pepper chicken, tempura shrimp ball, and a soft drink (A&W root beer in my case). For a fix price of only RM16, I got to enjoy my soft grilled black pepper chicken complete with rice and corn by the side. On top of the main, to complement the chicken, there was the tempura shrimp ball and root beer drink. It wasn't my first time having Secret Recipe's Grilled Black Pepper Chicken, but I always come back to this dish due to its ability to fill me up and tastes good too. The chicken thigh had this really tender texture and goes well with the black pepper sauce. Served in a pair, the Tempura Shrimp Ball was a must have. My first time popping these really crispy tempura coated shrimp balls, and it made me crave for more. Topped with a dash of mayonnaise, two pieces of these yummy balls wasn't enough for me though. 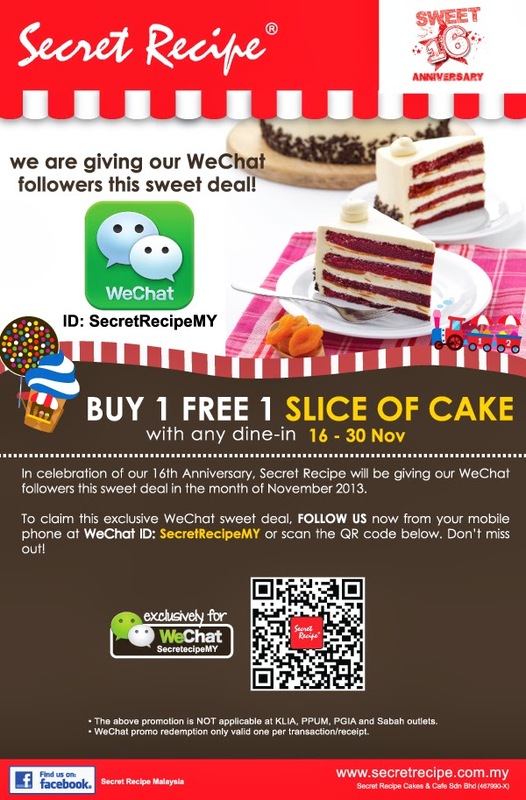 Coming back to what I mentioned at the beginning of this post, on top of the Candy Crushing RM16 Value Meal, Secret Recipe in collaboration with WeChat Malaysia will be offering Buy 1 Free 1 Slice Of Cake with any dine-in from 16th to 30th November 2013 too! Now you can enjoy two slice of your favourite cake for the price of one, marble cheese cake would be my preference. Just remember to follow SecretRecipeMY on WeChat for this sweet deal. If the above two promotion doesn't satisfy you, there's more! 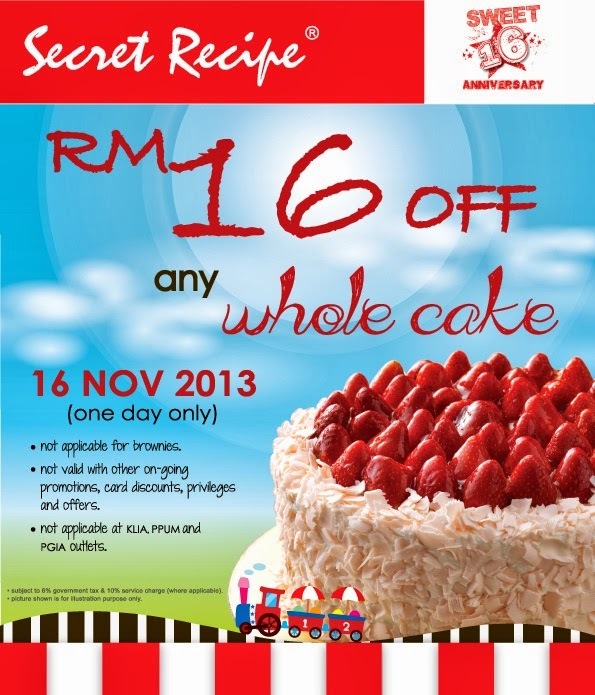 For only 1 day, on the 16th of November 2013, all whole cakes bought from Secret Recipe will have an RM16 discount off the listed price. I leave you with a few more food shots of the other sets that my fellow bloggers ordered that afternoon. Check it out below. There was a total of six different sets of value meals to choose from. Given another chance, I would have gone for Set E Candy Cooler Combo, just because there's ice-cream involved. Remember to drop by your nearest Secret Recipe this 16th November to take advantage of their Sweet16 Anniversary Promo deals. Also, remember to download the WeChat application on your smartphones and follow SecretRecipeMY. Have fun, enjoy your meals and Secret Recipe cakes! Sounds like a very good deal! Not the one here, thank you very much - they charge RM1 more than in Peninsula for drinks...and all the things baked/cooked in Kuching and they just heat them up over here, not fresh at all, so you can imagine how good the food is. the rm16 off is a good deal :) wee! RM16 is cheap but set A and Set F seems so little compared to the other sets.